A mother cleared of murdering three of her babies is banned from seeing her remaining child alone. Trupti Patel, 35, from Maidenhead in Berkshire, suffers a court order barring her from playing with the child unless she is watched. Despite walking free from court on Wednesday, the pharmacist must be supervised by one of a handful of people passed by social services. The court order, imposed soon after her baby Mia died suddenly in 2001, meant Ms Patel was forced to cut short her celebrations at the family home. It is believed she is staying with friends nearby. Social workers at the Royal Borough of Windsor and Maidenhead have promised to look again at the child's care in light of the not guilty verdict. A spokesperson for the council told BBC News Online: "Several people are cleared by social services to supervise Ms Patel." A statement from social services said: "This is a truly sad and tragic case, in which the Royal Borough's social services department became involved after being alerted by Thames Valley Police following the death of little Mia Patel in June 2001. "Social services' involvement has been in relation to the continuing the care of Mr and Mrs Patel's other child during this very difficult time for all the family. "In light of the verdict, social services will now reassess the child's needs and we will work with the family to ensure that appropriate support and help are available if needed in the days and months ahead and we hope for a positive outcome. "There is a now a legal process which social services has to adhere to but we will ensure that this is carried out with the greatest possible speed." 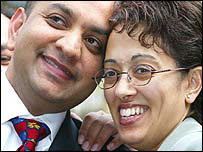 The child's two brothers, Amar and Jamie, and sister Mia each died aged less than three months between 1997 and 2001. Jurors at Reading Crown Court, who heard the children may have suffered from a rare inherited predisposition to cot death, took just 90 minutes to find Ms Patel not guilty. Outside court she hugged husband Jay and told reporters: "Words can't describe how we've been feeling. It should never have come to court." 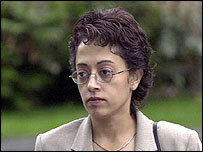 "Trupti Patel left court a free woman"